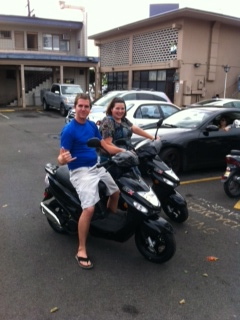 Aaron and Holli on their new scooters. Safety sticker is for life. A lot different than what we had to go through for the car. The Road to Hawaii, or how we sold (almost) everything, quit our jobs and moved to Oahu, as told by one family who is experiencing the journey. Before we moved to Hawaii, we’d heard a lot about “island time”, the slowing down of life, of savoring each moment instead of running helter-skelter, like we normally did on the mainland. After all, don’t we all move a little slower when we’re on vacation? Case in point, getting a Hawaiian license plate for the car. Back in Michigan, you went to the Secretary of State, presented your registration, proof of insurance and cash or check (and now debit! ), and ba da boom, ba da bing, you got a new tab or plate. Went to another station a block away. They told us they had the time but couldn’t do the inspection as our insurance form was made out for Michigan. We won’t discuss that I’d already checked with my insurance company and had been told the policy was good. I guess “policy” and “state it was issued for” are separate items. The next day (because I had to wait due to the 6 hour time change) I called Michigan to have the policy updated to Hawaii. But.. Inspection station #2 does not take temporary proofs of insurance. (Thanks for the heads up, Jane) Like there’s a gigantic forgery business going on. We’d have to wait 7-10 days for our permanent P.O.I. Other State Farm person didn’t know what to do (Really?) but, after some non-to-gentle prodding on my part, suggested we go to LEX BRODIE (and does that sound like a cowboy or what? ), a local tire store, because she’d heard they “might” be able to help. We go to LEX BRODIE, and finally, finally, talk to Barney, (who looks like he stopped here on his way home from Vietnam and decided to stay) who explained the “Chinese fire drill” to us. <insert our gasps at his politically incorrect remark on an island where Asians outnumber whites> Barney would love to take our temporary P.O.I. and perform a $14.75 inspection. Except.. He did have an opening Monday, Labor Day,(Someone please explain the concept of Labor Day) so we made an appointment. Which we kept. Barney inspected and approved and gave us a blue sheet of paper proving we had wheels, a/c, an engine and whatever else the State of Hawaii wanted proven. 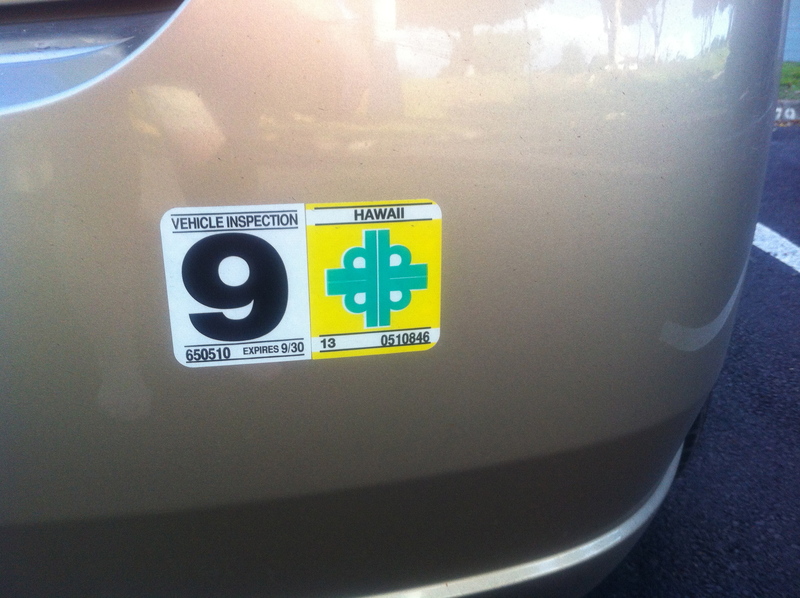 We trundled back to Barney, gave him the official Hawaiian (temporary) registration and new plates. He promptly put on the plates and the all important $317.00 safety inspection sticker. I’m sure I’ve missed a step or two. If anyone along the way would have said “Hey, you know, you should do this, this and this,” our odyssey would have been over in a day instead of a week. Unfortunately, we didn’t find Barney until the end. Life, on an island, has its own time. Cheryl Sterling currently resides in Waikele (the rich(er) neighborhood of the official city of Waihapu, where crack is made). You can find her books on Amazon and Barnes and Noble. From personal experience, anything they tell you is a lie. I’ve challenged them on it several times. No, Mr. Clerk, the box I’m sending to my daughter in Nome, Alaska will not be there in two days. Maybe a week, but most probably two. I know. You don’t. Stop believing in this sad, sad propaganda. When we knew we’d sold our condo, no, before then, we started packing our stuff in boxes. Once Aaron and Holli arrived in Oahu, we shipped boxes to them in care of General Delivery. Parcel Post. We were told the boxes would start arriving August 20th. Lies. Today is the 23rd, we’ve received three boxes, two of them Priority. We had been using one pan we bought used from Goodwill to cook with until we got a microwave yesterday. Between us, there are about twenty boxes en-route. Every delivery is a big deal. It’s sad but exciting when we open a box filled with Scotch tape, markers and Q-tips. Valuable stuff. Of course, the first things we shipped have the least value in day-to-day living. I don’t think receiving seven years of tax returns will bring as much joy as getting our pillows. And, Post Office? As they say in the South – Bless your heart.